Well, you can hang them as Christmas stockings - the small one for him, of course. I was thinking the same thing Jessica. Much too cute to hide away. Those socks are neat! Sorry about his problem but loved the story. Reminds me of the time a neighbor (mature college student, wife supporting while he learned) tried to help by doing the laundry. In those days almost everyone washed everything in hot water. He came over, tiny white sweater in hand and wanted to know how to fix it. Yes, he had washed several of his wife's lovely outfits in hot water. Sorry, Charlie, no fix. It wouldn't even fit my 4 yr old daughter. I was thinking that you could machine wash the unharmed sock and then give the pair to a child in the family. They would make funny Christmas stockings, though. 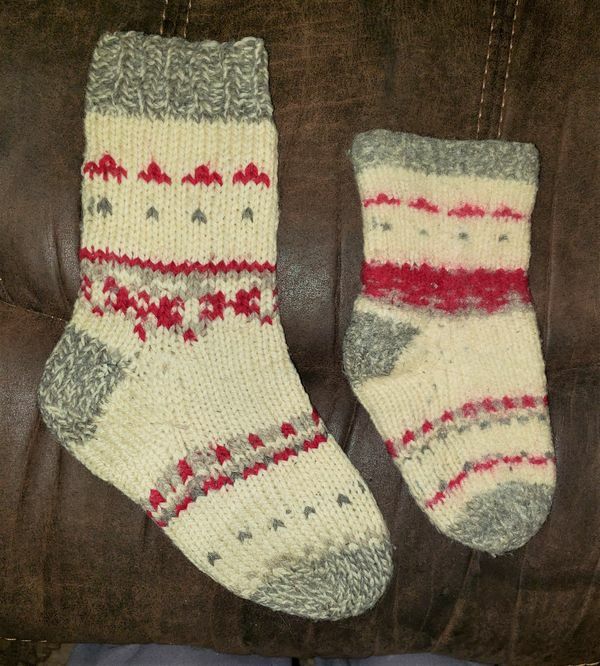 I love hand knit socks and yours are so pretty! Great minds think alike. I was thinking of making the little sock a Christmas tree ornament or part of a Christmas wreath. Felt the bigger one and give to a child maybe. Your husband does laundry! That is worth a ruined sock or two. Susan - that’s what I was thinking! I made a really nice pair of green socks for me. I didn't realise they were no machine wash wool. I gave them to a woman I worked with for her granddaughter. My darling has only learned to put his dirty clothes in the hamper. He even carries it down to the laundry area for me! More than that I can't imagine him doing. I keep an old shoe box in the laundry for the hand-knit socks to go into while waiting to be washed. That way none can accidentally get into the washing machine and possibly ruined.